Vernons Bingo is a nice and bright best online bingo site. The cute little pug playing in flowers adds a touch of ‘Awww’ to the bingo site. His name is Stan in case you were wondering! The color scheme is mainly purple and green and looks so modern. There are huge bingo jackpots, progressive jackpots and a huge selection of games – it’s no wonder why the bingo site was packed when I stopped by. So, deposit and spend £10 and you’ll get £35 to play with including your initial deposit. 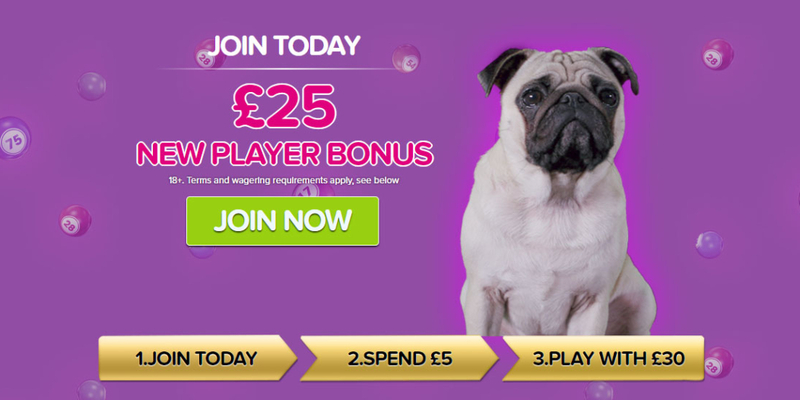 £25 is the maximum bonus available and if you deposit £10 it will be triggered as soon as you spend £5 on bingo. Triple your second deposit with the 200% deposit bonus. A £5 deposit becomes £15 to play with! (Max bonus available is £10). New bingo players who deposit at least £5, also get a month of free bingo in the Penthouse Bingo room. Vernons Bingo is a dedicated bingo site in its own right, but is also part of the larger Vernons.com site that was originally all about sports betting and the football pools (for those that remember them in pre-lotto days). The tabs for Bingo, Games, Promos, VIP and Help keep you within the bingo section, but the Casino and Sports tabs take you to the main Vernons site, although you will remain logged in with your bingo credentials and wallet. There are 14 bingo rooms in all with three from 75 ball bingo, including Deal or No Deal 75 ball, one for 80 ball separate rooms for Rainbow Riches Bingo and Cash Cubes Bingo, Lucky Numbers and Who Wants to be a Millionaire, with the rest dedicated to 90 ball bingo. The names of the rooms came with the site from its St. Minver days and include Bingo Cafe and Bingo Espresso; The Ballroom, Tea Room and Play Room are more recent additions. The new HTML platform makes the games a pleasure to play and meant the site could adopt some of the newer games like Cash Cubes. A limited range of games are available within the bingo client, all from either Playtech themselves or Eyecon. Titles include Mayan Mania, Gladiator, and Bounty of the Beanstalk, Sugar Train and Temple of Isis. The full selection of slots and scratch cards is available within the bingo rooms as well as in their own area, but some will pop out full size as they are not available in mini format to be played as actual bingo side games. You can easily move across to the main Vernons site from Vernons Bingo and use your same wallet to bet on the sports events of your choice. This section of the site offers you options for Sports, In-Play, Virtual Sports and then links around again to Casino, Games and Bingo – so you are never far away from where you may have started or where you would like to be. Horseracing, football, tennis, golf are all featured along with almost any other sport you can name and look for features like Score Draw Money Back and Acca Insurance. Processing time: 3 – 5 business days. Tel: UK free phone on 0800 484 0043 or from a mobile on 800 484 0043. International 0203 727 3916. You can fax or write to the team also, details are on the Contact Us page. Depositor Party – Vernons Bingo throw an exclusive party in the Penthouse room, every Wednesday between 7pm and 9pm. There’s 18 free bingo games being played and as long as you’ve deposited at least £10 the week before, you can join in on the free bingo action. Prizes are guaranteed between £10 and £20 and there will also be 3 games with a £50 prize on offer, but these tickets aren’t free – they cost 20p each. Not bad for a £50 prize though. Because it’s an exclusive room, you can expect fewer bingo players, meaning you have potentially more chance of winning. Bingo Linx – Games are being played on a daily basis, with jackpots of £10,000 every day! Head to the Bingo Café bingo room and buy your tickets for as little as 50p each. Games commence at 12pm, 6pm and 10.30pm. The guys at Vernons Bingo love to reward players for their loyalty, not only is there bingo jackpots and exciting games on offer, but they also have a bingo loyalty scheme for you to enroll in. Play as you normally would and you will accumulate points. The more you play, the more points you earn. You can convert these points into bingo or games bonuses. All promotions come with their own terms and conditions. Please check them out first. There are links on the site to the Facebook, Twitter and Instagram accounts for Vernons Bingo should you be interested in interacting with them socially, or just having handy access to notifications about the site. Facebook: A good place to try and win a £20 bonus every Friday! Join the fun here – https://www.facebook.com/VernonsBingo/ – you know you will be in the right place thanks to all the images of Stan the Vernons pug. You can also contact the site here and they aim to get back to you within just a few hours. The team also makes sure you never miss a decent promotion or big game that might be running on the site. Twitter: Once again you will know you are in the right place as the account name is Stan the Pug, although the Twitter handle is @VernonsBingo – https://twitter.com/VernonsBingo. Not quite as active as the Facebook page, but if you like lots of animal gifs and pugs in particular then it is worth a look. Instagram: https://www.instagram.com/vernonsbingo/ – pictures of pugs! You can access Vernons Bingo via any mobile device on the relevant mobile browser. The layout style of the mobile version of the site is similar to the desktop version; it’s simple and easy to understand. The menu is located at the top right hand side of the screen and contains all of Vernons Bingo’s sections, such as, ‘Bingo’ which contains all the bingo games, ‘Games’ which contains all of the slot games, promotions and many more. Vernons Bingo’s mobile version has all the same games as the desktop version, such as 90 and 75 ball Deal or No Deal Bingo, Lucky Numbers Bingo and Rainbow Riches Bingo. The games are fully optimised for mobile play. Overall Vernons Bingo is visually great and easy to navigate. It runs really well, with no crashes when testing and the whole experience is a great. iOS App Store – Presently there is iOS app available for Vernons Bingo.